Does the Energy East Cancellation Herald the End of Tar Sands Pipelines? TransCanada has cancelled its proposed Energy East pipeline after years of intense opposition from Indigenous communities, local and provincial governments, and environmental groups. Energy East would have transported 1.1 million barrels of tar sands a day, from Northern Alberta, across the continent to an east coast port in New Brunswick, and onward to Europe and Asia. It faced significant setbacks earlier this year when new representatives for Canada’s National Energy Board (NEB) voided all permits and forced the company to start the process from scratch after the previous panel stepped down amid accusations of operating with a conflict of interest last year. On October 5, TransCanada issued a statement cancelling the project. This decision follows on the heels of Enbridge’s failed Northern Gateway project, which Canadian Prime Minister Trudeau rejected in November 2016 (at the same time approving Kinder Morgan’s TransMountain and Enbridge’s Line 3). Although the NEB approved the Northern Gateway in 2014, the First Nations of the Yinka Dene Alliance filed a lawsuit and the Federal Court of Appeals revoked the permit, ruling that the Canadian government had failed in its duty to consult with aboriginal communities. The Northern Gateway pipeline would have carried 525,000 barrels per day of tar sands from Alberta, through the Great Bear Rainforest and pristine areas of unceded territory in British Columbia, to ports on the Pacific Ocean where it then would travel through treacherous archipelagoes by tanker. Even Trudeau saw that was a bad idea. After 8 years of lawsuits, blockades, and what seemed to be a final rejection issued by President Obama in 2015, TransCanada is yet again seeking to complete the Keystone XL (KXL) pipeline, after President Trump revived the project by Executive Order within weeks of taking office in February 2017. The company has yet to find financing and must overcome a series of major regulatory and legal hurdles in order to connect the tar sands to a pipeline nexus in southern Nebraska. South Dakota renewed approval for KXL in 2016 but in July 2017 Dakota Rural Action, the Intertribal Council on Utility Policy (COUP), and the Yankton Sioux Tribe appealed that decision to the South Dakota Supreme Court. The Nebraska Public Service Commission (PSC) is currently considering whether to grant a permit, and the decision is expected by Nov. 23. More than 90 intervenors have registered to challenge the application, including Nebraska landowners, the Ponca Tribe, the Yankton Sioux Tribe, Bold Nebraska, Sierra Club, 350.org and Oil Change International. Opponents say that they are confident that the PSC will reject KXL as not in the public interest. In the meantime, landowners are continuing to blockade construction by installing solar panels in the path proposed by TransCanada. Kinder Morgan is facing mounting resistance to the TransMountain expansion project, which would triple amount of the tar sands flowing to terminals that desecrate the Salish Sea. First Nations that would be directly impacted are fighting the project in the courts and leading heated protests on the ground. Dozens of people were arrested for blocking and locking down to construction around the sacred Burnaby mountain throughout 2014 and 2015. The mayors of Vancouver, Victoria, and Burnaby are also against the pipeline. British Columbia’s recently elected New Democratic Party-Green Party alliance have committed to “immediately employ every tool available to the new government” to stop the expansion all tar sands projects. A consolidated lawsuit made of numerous claims filed by First Nations, municipalities and environmental groups that oppose the approval of the pipeline will be argued in the Federal Court of Appeal over the next two weeks. The Line 3 “Replacement project” is Enbridge’s proposal to abandon a deteriorating pipe in the ground and bust a new tar sands corridor through the heart of Minnesota’s cleanest lakes and wild rice beds, terminating at the mouth of the Great Lakes, which hold one-fifth of the world’s freshwater. With a price tag of 7.5 billion dollars, this is the largest proposed project in Enbridge’s history. Though the Minnesota Department of Commerce submitted formal testimony opposing Line 3 last month, Enbridge’s proposal is alive and well, and they still feel so confident in a Minnesota approval that they are continuing construction in both Wisconsin and Saskatchewan, despite relentless direct actions by water protectors of the Makwa Initiative. The Final Environmental Impact Statement has not yet been deemed adequate, and hearings for a contested case process will be held throughout the next month. 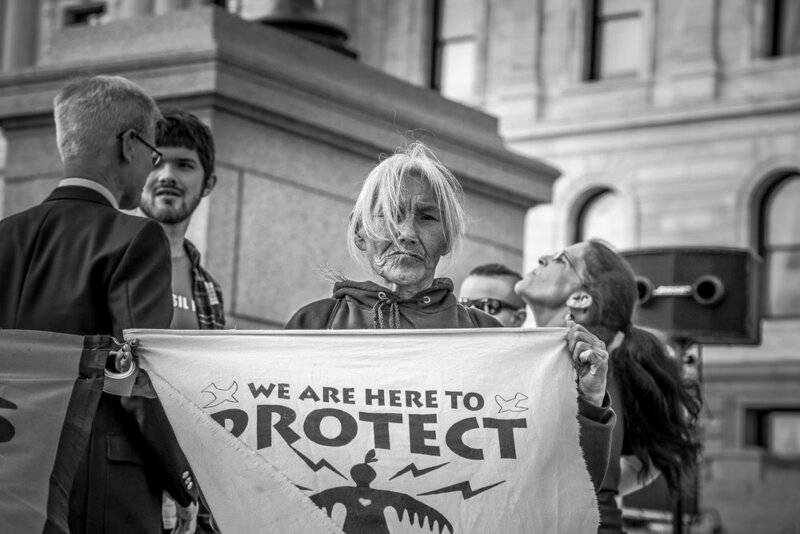 Enbridge is being challenged by all 5 directly impacted Ojibwe Tribes as well as environmental groups , landowners, and a group of 13 young people known as the “Youth Climate Intervenors.” A final decision on the MN permit is expected in April 2018, but the pending federal permit process by the US Army Corps of Engineers may involve an extended battle over Ojibwe treaty rights. So how do we fight all the battles at once? To shut down tar sands pipelines, we have to shut down the tar sands. This is easier said than done, but right now the tar sands industry is experiencing unprecedented economic vulnerability due to consistently low oil prices and the extremely high cost of tar sands extraction. Major oil companies have been withdrawing investments from the tar sands steadily over the past two years. A coalition of indigenous groups has put out a call to ‘Divest the Globe’, 3 days of global mass actions targeting the institutions that finance climate disaster and the abuse of Indigenous Peoples. From October 23-25, these days of action will happen as ninety-two of the world's largest banks meet in São Paolo, Brazil to discuss policies on the climate and Indigenous People's rights to Free, Prior, and Informed Consent (FPIC). "Divestment is the next stage in the fight against the black snake that has come to poison our lands," says Matt Remle of Last Real Indians, a leader of the coalition that successfully pushed the City of Seattle to divest over $3 billion from the banks behind the Dakota Access pipeline. "Big oil and their financial backers are not persuaded by moral and environmental arguments, so it is time to hit them in the pocket book. The resistance at Standing Rock changed the world - Indigenous Nations are rising up to create a future with clean water and respect for human rights." Get involved, follow Mazaska Talks and Stop Line 3!